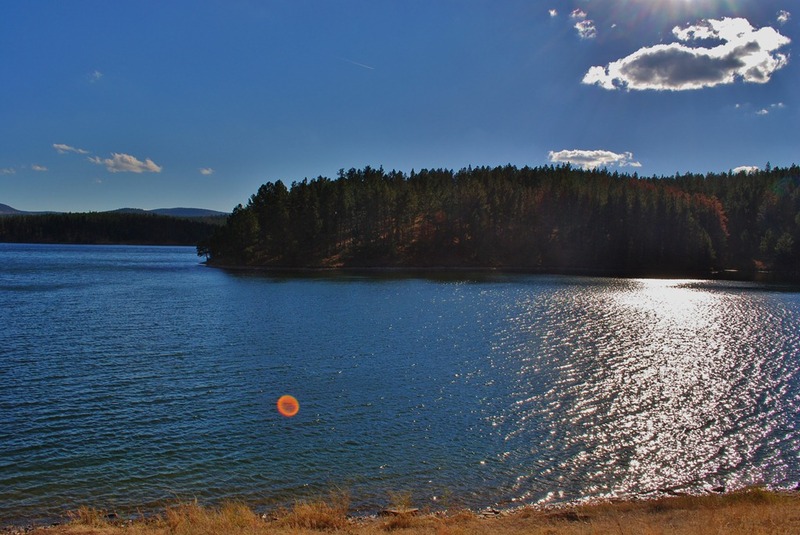 Deerfield lake is one of our favorites of the Black Hills Lakes. We like to go canoeing there all the time. The lake is a no wake lake – it is perfect for paddle boarding, canoeing and kayaking with children. The shore is accessible all around the lake, making it simple to get out of your boat anywhere along the shore. It is also a very popular for fishing all year long. And, with three campgrounds there are plenty of options for sleeping in the forest. Plus, there is a hiking trail that circles the lake and Flag Mountain Lookout is nearby. The lake is the result of damming Castle Creek. This created a lake with a surface area of 435 acres. The average depth is about 30 feet and deepest portions near the dam face are about 90 feet deep. This is certainly a peaceful place to camp. Hill City is 12 miles a way and there are no major roads running by the area. 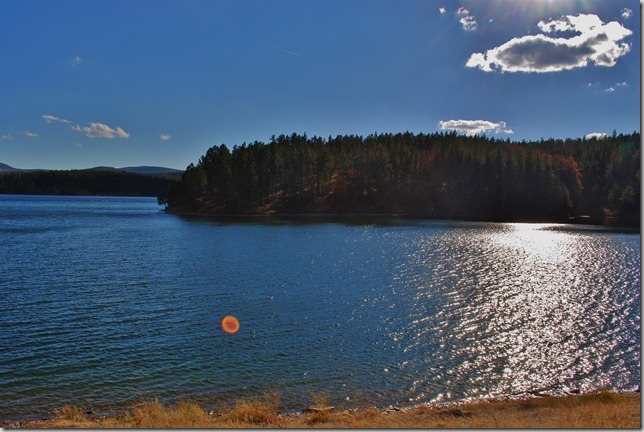 Custer Trail Campground – This is on the north side of the lake. There are 16 sites available on a first come first served basis. There is a trailhead for the Deerfield lake hiking trail here. Plus, there is a boat ramp and it is a popular spot for fishing. There area does require a day use fee even if not camping. Dutchman Campground – This is located on the southeast portion of the lake near the dam. There are 44 spaces that can be reserved. There is a campground host and vault toilets are in the campground too. The lake is just a short walk away. Whitetail Campground – Located on the southwest portion of the lake in between the Mountain City and Lake shore picnic areas. 17 camping sites are available and can be reserved. Access to the Lake Loop Hiking trail is nearby. The lake is home to brook, splake and rainbow trout. The lake is regularly stocked with rainbow trout and has even produced record brook trout. Fishing does require a South Dakota Fishing License. Ice Fishing – The shallow waters near cattails seem to be popular with fishermen. People report catching brook, splake and rainbow trout. Lake Fishing – The lake is home to brookies, largemouth bass, trout and more. This is a no wake lake and no minnow lake as well. Stream Fishing – Castle Creek in and out of the lake can be good for fly fishing. As with many areas of the Black Hills the hiking here is varied between meadows and pines. It is a beautiful area. It is always a good idea to be prepared. Carry a good map like Black Hills – Northeast, South Dakota Trails Illustrated Map #751 (National Geographic Maps: Trails Illustrated) – the trail and trailheads are clearly marked – a must for any hiker. The weather changed quickly in the Black Hills be prepared. Deerfield Trail #40 – This easy to moderate 18mile trail connects Deerfield Lake to Rapid Creek and Pactola Reservoir. It intersects with the Mickelson Trail at the Daugherty Gulch Trailhead. There are no services located on the trail – be sure to pack plenty of water and food with you. Deefield Lake Loop Trail – This 10 mile trail circles the lake. It traversed through pine and meadows. There are four trailheads for the trail: Custer Trail Trailhead, North Shore Trailhead, Hill Top Trailhead and Gold Run Trailhead. The trail is rated as easy. This is a fantastic area for a summer picnic. If often seems we have the picnic area to ourselves. The lake is beautiful and it there are plenty of places to go for a walk after your lunch. Dutchman Campground – Picnic area available in the campground on the southeast side of the lake. Lake Shore Picnic Area – Located on the southwest side of the lake. There are 11 picnic sites. And, as the name suggests it right along the shore. Mountain City Picnic Area – This picnic area has a private feel to it. Up on a hill with great views of the lake. Near the Whitetail Campground. If you are visiting the Black Hills consider putting Deerfield Lake on your list of places to visit. Be sure to have a good map like Black Hills – Northeast, South Dakota Trails Illustrated Map #751 (National Geographic Maps: Trails Illustrated) , it has all the trails, campgrounds and picnic areas well marked. Also, checkout my Black Hills Map to find the location of this lake and others in the area.